What is a Drawdown Control System? A Drawdown Control System is an active effort toward directing and controlling drawdown in an investment portfolio or fund. Drawdown control is the thermostat that controls the temperature to keeps investment management clients in the comfort zone of their risk tolerance. Drawdown is the decline in value from a prior peak value. Below is an example of a drawn % off high. 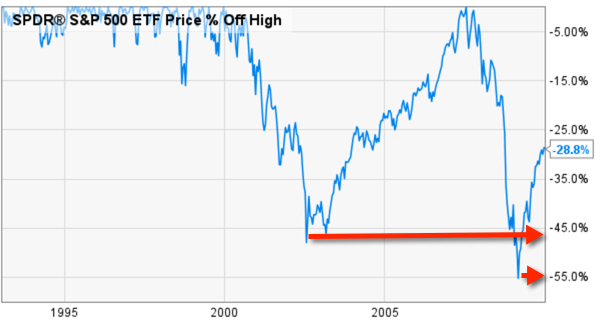 In this example, the stock index had a drawdown of nearly -50% from 2000 to 2003 and then -56% from 2007 to 2009. Control is to determine the behavior or supervise the running of something or someone. Drawdown control intends to limit the declines in an investment portfolio. Successful investors find an investment program that fits them and their objectives/tolerance for return/risk so they can get through any emotional aspects of it. But, drawdown control is the thermostat that controls the temperature to keeps investment management clients in the comfort zone of their objectives and risk tolerance. Drawdown Control systems and methods used by Shell Capital Management, LLC with the intention to limit and control the magnitude of the drawdown.